The Bet365 Early Payout Offer can be one of the most profitable offers for matched bettors. This offer is an advantage play offer, meaning that you may not profit from it every time that you do it but the odds are in your favour that you will make a profit over time. what is the bet365 early payout offer? When you place a bet through Bet365 on football matches in specific leagues or competitions, Bet365 will pay your bet out as a winner as soon as the team you backed goes two goals ahead, regardless of whether or not the other team comes back to draw or win the game. Bet365 also run this promotion occasionally for tennis, rugby and NFL matches but it is most people when used on football matches due to the number of eligible games available each week. Available on the following leagues and competitions: English Premier League, English Championship, English FA Cup, English EFL Cup, Spanish Primera Liga, Italian Serie A and German Bundesliga as well as the UEFA Champions League and UEFA Europa League. The basic strategy for making a profit from this offer is to back a team to win on Bet365, lay your chosen team on a betting exchange and hope that your team goals two goals ahead at some point in the game. If they do go two goals ahead, Bet365 will pay your bet out as a winner. You should more or less break even at this point as your back bet has won. However, your lay bet is still active and it is possible to cash out your lay bet of which the majority will be pure profit. The aim is to find a close match on an eligible football game in order to keep qualifying losses down. You can place as many bets as you like on eligible matches and they will all qualify for the early payout offer. What is even better is that there is no limit to the amount you can stake and be paid out. Make a guaranteed profit by cashing out your lay bet on the betting exchange. You've already been paid out on Bet365 so whatever you cash out is profit. If the other team gets a goal back or something happens in the game which makes the odds on your team winning increase then your cashout value is going to increase. There are pros and cons of both options listed above. If your team goes two goals up then the sensible thing to do is cash out your lay bet to ensure you make a profit. However, if it's looking likely that the other team will score or if the cash out value is very low, you may opt to take the chance and hope they get a goal back. If they do, the odds on your team to win will increase and so your cash out amount will be more. When deciding on which teams to pick for the early payout offer, you have two options. If you pick a short-priced favourite then it's more likely that they will go two goals up but it also means that your cash out amount will be relatively low. If you pick an underdog, they are less likely to go two goals ahead but if they do, your cash out value will be greater. However, what is more important is that you pick teams which have a low qualifying loss. This means that their back odds on Bet365 are very close to their lay odds on the betting exchange. The best way to find teams for Bet365's early payout offer is to use an odds matcher. Simply search for a match which has a low qualifying loss. Remember to use the filter on the odds matcher to only display matches from eligible leagues and competitions. Most matched bettors don't bother picking teams when the pre match win odds are very low. We would recommend picking teams with odds of 1.7 or greater as any less than this and your cash out value will be very low. Using an odds matcher, we have found the Manchester City vs Liverpool match. The odds on Man City to win are 2.5 and on the betting exchange, the odds on Man City not to win (the lay odds) are 2.51. 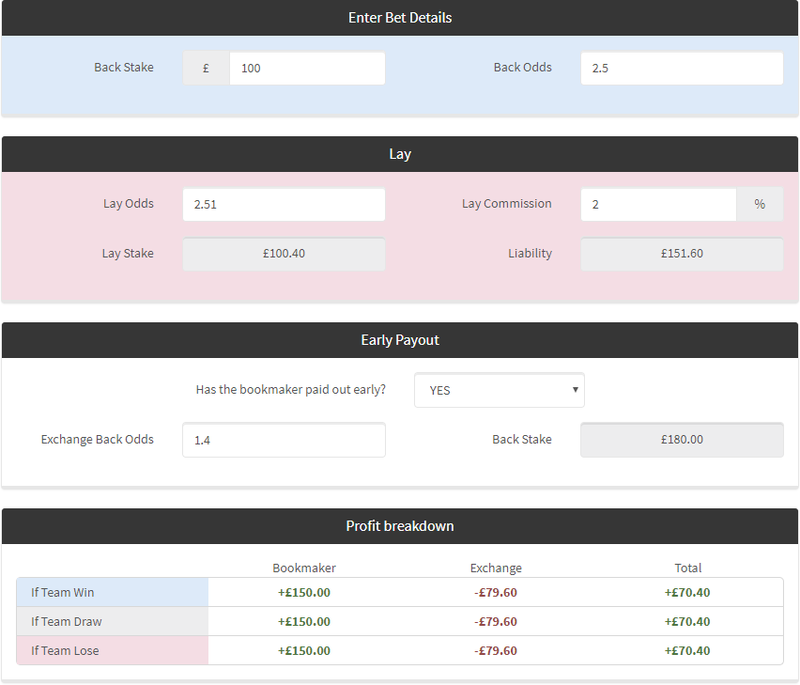 We have decided our back is is going to be £100 (it can be anything you like) and so we input these details into a matched betting calculator to determine our lay stakes. The calculator tells us that our lay stake on Smarkets should be £100.40 with a liability of £151.60. Our qualifying loss for this bet at the moment is £1.60. This is the amount we stand to lose if our chosen team does not go two goals ahead at any point in the match or if they do and we don't cash out our lay bet. We place our £100 bet on Man City to win on Bet365 and place our £100.40 lay bet on Smarkets. You don't need to activate the offer on Bet365. All bets on eligible games will automatically qualify for their Early Payout Offer. If your team does not go two goals up in the game then there is no action to take. You will have lost your £1.60 qualifying loss but don't worry, there are plenty more games. If your team does go two goals up then you have the option to cash out now or wait to see if the other team gets a goal back in which case your cash out amount is likely to be higher. To cash out your lay bet you have two options. 1. Use the cash out feature on the betting exchange. Betfair use the term 'Cash Out' but Smarkets call it 'Trade Out'. You can see how to cash out your lay bet on either site in the image below. 2. You can use the OddsMonkey Early Payout Calculator. This nifty calculator was developed specifically for early payout offers such as this and Paddy Power's 2 UP offer. Simply enter in the details and it will tell you how much to stake on your team in order to return a profit. Let's say that once our team has gone two goals ahead, the odds on them to win are now 1.4 on the betting exchange. The Early Payout Calculator tells us that we should place a back bet of £180 on our team to win in order to make £70.40 profit no matter what happens in the remainder of the match. Your total profit from the Early Payout Offer comes from your cash out value minus your initial qualifying loss. Therefore, to generate more profit, your cash out value needs to be greater. The cash out value is dependent on what the odds are on the team you backed to win the game after they have gone two goals up which is why it is sometimes not worth picking teams which have low odds pre-game as once they have gone two goals up, their odds to win will be extremely low. Let's take a look at a few examples of odds pre-match and once the team has gone two goals up. You can see that the higher the pre match odds are for the team you back, the higher the cash out value will be if they go two goals up. Of course, if a team has higher pre-match odds, they are more unlikely to go two goals up and so while you get a higher cashout, it will happen in fewer matches. There are other aspects which can alter the amount of cash out and profit you make when doing the Bet365 Early Payout Offer. 1. If a team goes two goals up early in the game, their odds will be higher to go on and win the game than if they go two goals up with 5 minutes remaining as it's unlikely that the other team will have time to get goals back. Therefore, your cash out value will be higher. 2. Your team may go two goals up but may be down to 10 men. This would also cause the odds of your team to be higher as they are at a disadvantage. 2. The qualifying loss is no more than £2 per £100 back stake. The Bet365 Early Payout offer is one of the most profitable matched betting offers. You won't make a profit on this offer every time, but when you do, the profits can be substantial. If you're new to this offer we recommend starting with low stakes until you get used to it. Once you do, you can increase your stakes and hopefully get some very nice cash out profits. A good thing about this offer is that it is available on a number of the top football leagues. With matches being played most days, there are frequent opportunities to generate a profit. Most football offers such as price boosts and matched bets happen on weekends and so this is an excellent offer to do during the week when you may have available funds in your Bet365 and Exchange accounts. Your profit comes from locking in a profit after your team goes two goals ahead at any point in the game. This can be 2-0, 3-1, 4-2 etc.